Tagraíonn an t-ainm an Mheaspatáím, Mesopotamia, ón Sean-Ghréigis Μεσοποταμία, "idir na haibhneacha", do réigiún i gcóras aibhneacha an Tigris agus an Euphrates. Is ionann an Mheaspatáim agus an Iaráic, chomh maith le cuid d'oirthuaisceart na Siria, oirdheisceart na Tuirce agus iardheisceart na hIaráine. Úsáidtear an téarma bilád al-rafidain, "tír an dá bhruach", in Araibis ó am go chéile mar mhalairt ainm don Iaráic. Ba iad muintir na Suiméire agus na hAcáide (ina measc muintir na hAisiria agus na Bablóine) príomhshibhialtachtaí na Measpatáime ó thús na staire scríofa (circa 3100 bliain roimh Chríost) go dtí turnamh na Bablóine sa bhliain 539 R.C. Sa bhliain sin, ghabh na Peirsigh í. Ghabh Alasdar Mór sa bhliain 332 R.C. í, agus bhí sí faoi smacht na Seiliúcach i ndiaidh a bháis. 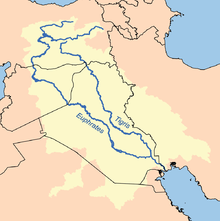 Timpeall na bliana 150 R.C., bhí an Mheaspatáim faoi smacht na bPairtiach, agus lonnaigh siad a bpríomhchathair, Ctesiphon, inti, ní i bhfad ón áit ina bhfuil Baghdad na hIaráice sa lá atá inniu ann. Bhí sí ina cnámh spairne idir na Pairtiaigh agus na Rómhánaigh. Sa bhliain 226 AD, ghabh ríthe Sasánacha na Peirse í. D'fhan an réigiún faoi cheannas na bPeirseach go dtí teacht na nArabach sa 7ú céad. ↑ 1.0 1.1 "Geography of Mesopotamia - Thematic Essay - Timeline of Art History - The Metropolitan Museum of Art". ↑ "Acmhainn.ie". Dáta rochtana: 25 Meán Fómhair 2010. ↑ "An tSuiméir". focal.ie. Dáta rochtana: 25 Meán Fómhair. ↑ "An Acáid". focal.ie. Dáta rochtana: 25 Meán Fómhair. Portail sur la Mésopotamie Histoire et Cultures de l'Orient ancien. Tugadh an leathanach seo cothrom le dáta an 3 Meán Fómhair 2015 ag 13:18.